Gentle Readers, you probably don't know this about me, but I am awwwwwwwful at keeping a secret/surprise. THE WORST. So, when Teh Bear's PS3 died on Cyber Monday I was like, "Score! Christmas present win!" Ok, not really, I hadn't planned on spending that much, but I will say the old PS3 chose the right day to die since it was so insistent on being dead (due to overheating, anyone know how to fix a PS3?). I am also a really bad liar. All the classic signs that someone is lying to you? I do them. I'm so textbook. Fortunately, Teh Bear didn't notice (or isn't admitting if he did). So I ordered it that same day, and I thought Teh Bear had seen my Amazon screen (which was showing my recent searches), he says he didn't. In actuality, he was probably too distraught over his original PS3 dying to have cared what was on my screen, but when you have a secret, you're always super defensive.. or maybe that's just me? So anyways. Teh Bear was expecting a package delivery the same day the PS3 was supposed to arrive and the worst liar ever (me) checked the tracking info and I was excited so I announced that my package was also out for delivery. Teh Megan fail. Later that evening when the doorbell rang, Teh Bear made a movement to get off the couch to check the door and I glared at him, which he understood meant he was NOT to be relocating. I would have thought this behavior suspicious, but Teh Bear thinks I'm crazy, so it was probably nothing. Knowing that the box was going to be outside, I unlocked Yurtle on the way to the door, hoping that the TV was loud enough that Teh Bear wouldn't hear the beeps. I opened the door and quickly assessed the packages and found the one for me and ran it to Yurtle, I quietly shut the door, and ran back to the door and said, "Well, yours came but mine didn't," as I moved the remaining two boxes inside for him. Teh Bear was very upset that my box hadn't arrived and told me I should call UPS and check and see where it was. I had to play it off like it was no big deal (another weird behavior for me) and that it was probably just "Lexington Park mail" (which is probably the worst mail processing center ever, it competes with overseas military mail, which takes a long time) and that the package would come tomorrow. Teh Bear let it go, thankfully. I was starting to feel the pressure of the secret. It was like the pressure of The Ring in LOTR. The next morning, Teh Bear was sleeping during the day since he had to work that night, so I decided to wrap the present and stash it at Teh Greyhound Neighbors' house so it wouldn't be at Teh House. I was in such Top Secret mode that any trash paper I brought to Teh Greyhound Neighbors house to throw away so it wasn't even in the trashcan. After much thought, I finally figured out how I was going to set up the present situation. I didn't want the PS3 under the tree. Teh Bear has that ability to shake/feel a present and know exactly what it is. I couldn't have that. No way. The mission had come to far to fail at the end. I decided that I was going to put the PS3 under the downstairs bathroom counter and ensure there was an empty toilet paper roll on the holder, so Teh Bear would have to change it if he needed TP. I was worried for a few days because all the rolls of TP that we were using were full and I wasn't going to be able to get an empty roll to put on the holder. Fortunately, we finally used an entire roll and I pulled the empty roll out of the trash to stash in the bathroom until Christmas Eve. On Christmas Eve, I went on a walk with Teh Greyhound Neighbor-Wife and after our walk, I picked up the PS3 from them. I left the PS3 in Yurtle when Phil and I got home, locking the car at least 3 times, just to be sure. Before bed, Teh Bear decided to take a shower and it was like Lady Fortune was smiling down upon me. I took advantage of the opportunity and ran outside and grabbed the PS3 from Yurtle and put it under the bathroom counter and changed the TP roll to the empty roll. In my excitement, I was speedily going back up the stairs and when I went to make the turn, I slipped due to non-grippy socks, grabbed the railing for dear life and felt my feet shoot out from under me in the wrong direction. After hearing my outburst, Teh Bear comes out of the shower to check on me, despite me telling him I was fine, because he thought I had fallen down the stairs since he knew that I had been upstairs when he got in the shower. I was torn between aching and being unable to breathe and being relieved that he hadn't heard me go out the squeakiest door ever to retrieve the PS3 from Yurtle. After I was finally able to move all my body parts again, I went slowly up the stairs to get the stocking items so I could fill the stockings. I was much more careful moving after the fall. Christmas morning, we got up and slowly started functioning.. meaning I let Teh Bear sleep until 7:30 and then it was time to get up for PRESENTS because CHRISTMAS!!! There were no photos of us opening presents because it was just the two of us. Teh Bear didn't express his disappointment that he didn't get very much in the way of presents he didn't know about from me because he was on the phone with his kids while they opened presents from him by 9. While he was on the phone, I was in communication with Teh Greyhound Neighbor-Wife, telling her that we'd had "no movement yet" because there's a 50/50 chance that a dude will need to use TP, and Teh Bear had only been to the bathroom once and there were no loud exclamations, much to my disappointment. I had observed that his "movement" the day prior was around noon, so I was anticipating having to wait for a while. When he came downstairs, I could kinda tell something was up, but he wasn't really saying anything, so I hopefully assumed (and was semi-correct) that it was due to the inability to skype with his kids. I had purposely not given Teh Bear one of his presents to open since it was a PS3 game and I didn't want him to think that he had gotten a PS3, but I realized the truth of the situation was that I had purchased the game on Black Friday when he still had a PS3. I gave it to him and told him the explanation that I didn't want to rub it in but I had purchased it on Black Friday, sorry.. He opened it, and he was like "Aw, thanks, a game I can't play," and stacked it with the other PS3 games. Teh Bear was messing around in the living room, then a few minutes later I heard him go in the bathroom. 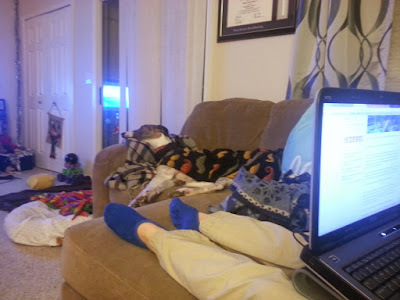 I quickly messages Teh Greyhound Neighbor- Wife and said, "I think we have movement!" I was wrong, but Teh Bear, being the swell guy he is, saw the empty toilet paper roll and decided to change it. He opened the cabinet and there was a strange box staring at him (probably should have gotten photos of that). I heard the toilet flush and Teh Bear came out and said, "Why is there a box under the bathroom sink?" I said I didn't know. He said, "There was a note on it that said it had to be opened in front of you, what is in it?" I responded again that I didn't know and maybe he should just bring it out to open it in front of me. I messaged tGN-W back and confirmed he had found the box. He brought it out to the living room and I grabbed the camera. I figured by this point, he would know what it was... apparently not. After a wrapping paper scandal for his birthday present (where it was suggested that I had just given him a Christmas gift for his birthday AND the wrapping paper was "Christmas-y"), Teh Bear commented that he liked this wrapping paper. "YESS!!! A box from Amazon!" "I was wondering where all the dog towels had gone, I couldn't find any in the closet the other day when you were doing laundry." I had put the towel in the box in case he decided to shake the box to figure out what it was. Leftover garland can always be repurposed. I think this made up for the fact that I gave him a pack of underwear for Christmas. Setting up the new system. This was pretty much the side of Teh Bear that I saw for the rest of the day, which I considered a success. Honestly, having a working PS3 again has been delightful. We'd been streaming Netflix through the TV, which is pretty horrible. And the ghetto laptop was set up for Harry Potter marathons, watching Grey's Anatomy, and watching Amazon Prime, which isn't available through the TV. While Teh Bear was going through intro videos for GTA5 and Skyrim, I took a nap. During our Christmas Hangover (which apparently is a real thing, although I thought Teh Bear was just being silly when he mentioned it, but it was confirmed via the blogging world), Teh Bear handed me a remote and we started playing Little Big Planet together. Despite my lack of skill and our frustration outbursts, it's a pretty fun game. One of the first things I accidentally learned was that you can stamp yourself, so I will now always have rainbow shoe face. YAY for a successful Christmas! !